Rating: 84 percent based on 816 votes. 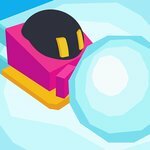 Description: Snowball.io is a fun multiplayer game where you take part in an epic snowball fight. Move around and try to build up a large snowball and then throw it at other players to try and knock them off of the map. Try and be the last man standing.